Mossberg offers a set of non-functioning training firearms that includes the five gun types used in hunter education seminars: pump-action shotgun, semi-automatic shotgun, break-action shotgun, bolt-action rifle and lever-action rifle. Each training firearm in this set features blaze orange stock and fore-end to ensure safe, hands-on training. On each gun’s receiver, “Non-Functioning Gun” is clearly engraved. Each gun comes packed in an individual soft case and the set can be purchased with or without a rolling travel case. Iver Mossberg, CEO of O.F. Mossberg & Sons, stated: “We are pleased to offer this 5-gun training set, allowing students to learn safe gun-handling with actual firearms that have been disabled.” The Mossberg 5-Gun Training Set is available for $1,300 and the set with a handy, rolling travel case is available for $1,500. For more info please contact Mossberg Law Enforcement Sales at Conservation@mossberg.com or call (203) 230-5300. 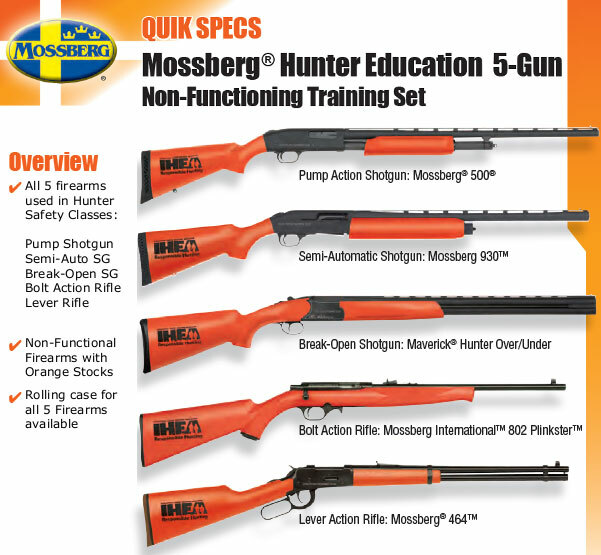 Share the post "Mossberg Five-Gun Training Set for Hunter Education Classes"
Want to purchase “Mossberg offers a set of non-functioning training firearms that includes the five gun types used in hunter education seminars: pump-action shotgun, semi-automatic shotgun, break-action shotgun, bolt-action rifle and lever-action rifle. Each training firearm in this set features blaze orange stock and fore-end to ensure safe, hands-on training. On each gun’s receiver, “Non-Functioning Gun” is clearly engraved. I am a hunters safety instructor in Kansas. My question is can a person order just the pump shotguns? I was hoping to obtain a set of these training guns. Are they still available and what is the price? I have just acquired a 5 gun set but it is not the same as I have seen in Mossberg’s advertising. Our instructors are all volunteers and most everything is out of pocket expenses. Could you tell me where I could get info (specs) on our 5 gun types in media that would be appropriate to displaying right with the firearms? The Mossberg link to the specs dead ends with an error. I also have a tough time reading specifics on barrels and actions.